In a radial system, separate feeders radiate from a single sub-station and feed the distributors at one end only. A single line diagram of a radial system for AC distribution is shown in the figure. Here substation supplies power to a distributor AB at end A through feeder OC. This system is only employed when power is generated at low voltage and the substation is located at the center of the load. Its initial cost is minimum. It is the simplest distribution system. The end of the distributor nearest to the feeding end would be heavily loaded. The consumers are dependent of single feeder and distributor. Therefore, when a fault occurs on the feeder or distributor, the supply is cut off to all the consumers who are on the side of the fault away from the substation. The consumers at the far end (B) of the distributor would be subjected to serious voltage fluctuations because of changing the load on the distributor. Due to the above limitations, this system is used for short distance only. In this system, the feeder closes on itself i.e. it forms a complete ring and hence the name ring main system. Fig. shows AC ring main system, where BCDAB is the closed feeder supplied by the sub-station S at point B. The various distributors are connected to points A, C and D of the feeder. 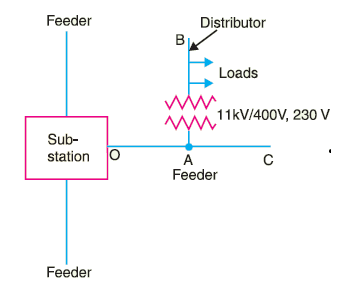 Each distributor is supplied via two feeders, for example, the distributor connected at point C is fed via feeder BC and BADC. This reduces the voltage fluctuations at the consumer’s terminals to some extent. The system is more reliable since each distributor is fed via two feeders. In the event of a fault on any section of the feeder, the continuity of supply can be maintained. For an instant, suppose fault occurs at any point F of section CD of the feeder, then section CD of the feeder can be isolated for repairs and at the same time continuity of supply is maintained to all the consumers. In this system, the feeder ring is energized by two or more than two generating stations or substations. The figure shows the single line diagram of AC interconnected system, where the closed feeder ring ABCA is supplied by two generating or substations S1, and S2, at point X and Y respectively. 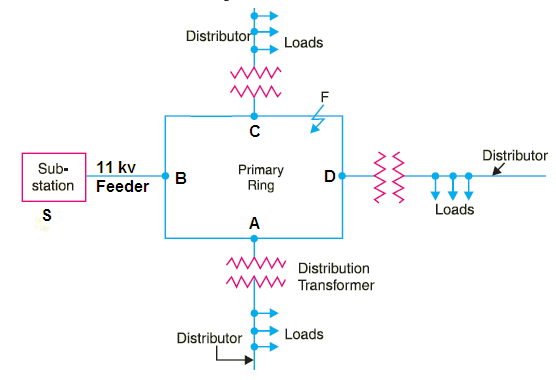 Distributors are connected to the feeder at point A, B and C.
It increases the reliability of supply. During overload hours, the area fed from one generating station can be fed from other generating station. Thus it reduces the reserved plant capacity, improves the service reliability and increases the load factor and efficiency of the system. The main elements of a distribution network are the feeders and distributors. To maintain a required voltage at the terminals of a consumer, proper care has to be taken while designing these elements. Feeder design: While designing a feeder, the main consideration is of its current carrying capacity. The voltage drop consideration is relatively un-important. The reason is that the voltage drop in a feeder can be compensated by means of voltage regulating equipment placed at the sub-stations. 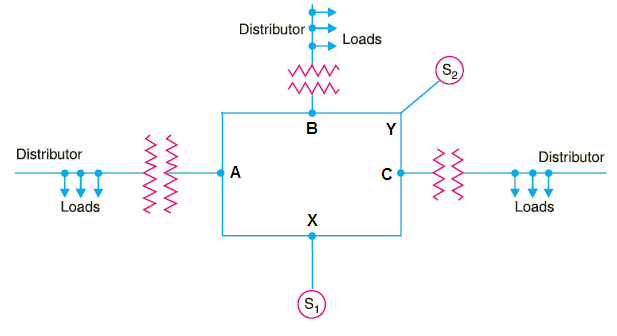 Distributor design: While designing a distributor, the main consideration is the voltage drop in it. The current carrying capacity consideration is not that much important. The reason is that the distributor supplies power to the consumers and there is a statutory limit to the voltage fluctuations at the consumer’s terminals. Hence the size and length of the distributor are designed in such a way that the voltage at the consumer’s terminals is within the permissible limits. Thanks for reading about connection schemes of distribution system. 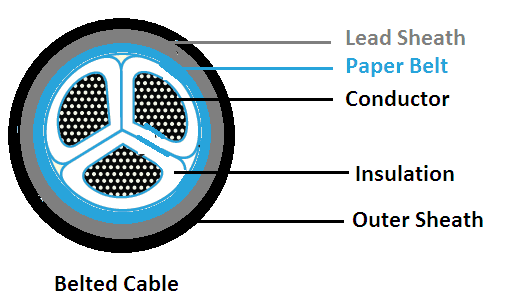 © https://yourelectricalguide.com/ connection schemes of distribution system.